How Do You Say, Merry Christmas? 2. Alabama was the first state to recognize Christmas as an official holiday, and the tradition began in 1836. 11. The most popular Christmas song of all time is Bing Crosby’s version of “White Christmas.” And “Silent Night”-arguably the most recognizable Christmas hymn-was written in 1818, by an Austrian pastor, Joseph Mohr. As Christmas Eve came, that year, the organ in his church was broken, so together with his friend, Franz Gruber, he wrote this new tune for the service that night, and played it on his guitar for his congregation. 12. “Jingle Bells” was originally written for a Thanksgiving celebration, in 1857. 13. The Christmas abbreviation-Xmas-is thought by some to be sacreligious, but in fact the first letter of the Greek word for Christ is chi, which is X. Before the invention of the printing press, “Xmas” was often used, in print, to save time and ink. Why are there Twelve Days of Christmas? Traditionally, it took the ‘Three Kings’ this number of days to find the baby Jesus. Their arrival on the twelfth day was celebrated in the form of the Feast of Epiphany in medieval France, and later in other countries. Where did the Candy Cane come from? In a small Indiana town, there was a candymaker who wanted to spread the name of Jesus around the world. 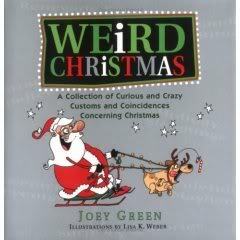 He invented the Christmas Candy Cane, incorporating symbols for the birth, ministry, and death of Jesus Christ. He began with a stick of pure white, hard candy to symbolize the Virgin Birth. The candymaker formed the stick into a “J” to represent the name of Jesus. It can also represent the staff of the “Good Shepherd.” He thought the candy was too plain so he stained it with a red stripe to symbolize the blood shed by Christ on the cross. Shoeing the Wild Mare is a traditional Christmas game that goes back to at least the early 17th century. Get a narrow(a few inches wide),strong wooden beam and suspend it from the roof with two even length ropes. The beam is the ‘mare’ of the title and should be level yet high enough above the floor so that a player’s feet are off-ground. A player ‘the farrier’ then sits on the ‘mare’ in the centre, a leg either side. This player has a hammer and has to give the underside of the beam “four time eight blows” at a designated spot. If he falls off, it is someone else’s turn. Apparently this is the best game ever to play on Christmas Eve. Make sure you have the fire department on speed dial though. Very popular from the 16th to the 19th centuries, Snapdragons (or Flapdragons) has explicably declined in popularity. Gather everyone around the dining room table, place a large flat dish in the centre. In the dish scatter a good handful of raisins then pour on top a layer of brandy or cognac. Set fire to the brandy and dim the lights. Players take it in turns to pluck a raisin out of the burning liquid and eat it quickly down. For a more competitive edge to the game use larger dried fruit such as apricots, one of which has a lucky sixpence stuffed inside. Goodness – you did a lot of research! I like the snapdragons game. Sounds exciting! LOL. The Shoeing the Wild Mare sounds like a dangerous teeter-totter game. This was a fun read and now I know how to say merry christmas in a bunch of languages (well, at least until I leave this page when they will immediately be lost in the dark recesses of my terrible memory). Yikes. The info about the candy cane was something I knew. Very cool. The different translations of “Merry Christmas” enlightened me. I really like “God Jul”. I even knew about Silent Night. Great story, even better song. Thank you for spreading the “Yuletide news”. The ‘net needs more posts like this. Oh what a cute name for xmas website – Yuletide News – I wonder if anyone has taken it? Interesting reading Annie! Lots of good fun and I needed that smile tonight. Thanks! It amazes me how arbitrary many of the traditions started out, how entirely inaccurate and random. LOL. I loved these. Geez, I didn’t know anything about the holiday. I got your card, btw, thanks it was so great to get it. They are fun little factoids, eh? Good stuff, but you left out that the best Xmas poem, The Night Before Christmas, was written as a present to the author’s family, and was never intended to go public, and that many of our Christmas traditions, such as having a tree in the house, were adopted from various European pagan religions by the Catholic Church, as was the winter date, in an effort to supplant those cults. Still, except for having it start before Thanksgiving these days, I like what we’ve done with the idea. A very Merry Christmas to you and yours too, Grit. Hope it’s wonderful for you. Celebration of the Norse New Year; a festival of 12 nights. This is the most important of all the Norse holidays. On the night of December 20, the god Ingvi Freyr rides over the earth on the back of his shining boar, bringing Light and Love back into the World. In later years, after the influence of Christianity, the god Baldur, then Jesus, was reborn at this festival. Jul signifies the beginning and end of all things; the darkest time (shortest hour of daylight) during the year and the brightest hope re-entering the world. During this festival, the Wild Hunt is at its greatest fervor, and the dead are said to range the Earth in its retinue. The god Wotan (Odin) is the leader of this Wild Ride; charging across the sky on his eight-legged horse, Sleipnir; a very awe-inspiring vision. In ancient times, Germanic and Norse children would leave their boots out by the hearth on Solstice Eve, filled with hay and sugar, for Sleipnir’s journey. In return, Wotan would leave them a gift for their kindness. In modern times, Sleipnir was changed to a reindeer and the grey-bearded Wotan became the kindly Santa Claus (Father Christmas). Santa Claus, Indiana has the BEST water park. The theme park is Christmas-themed, but the water park is freaking awesome. We go there every summer. Wow, you’ve been there? Tre’s cool, Red. Send pics! You should be getting mine today, no later than tomorrow. I had a little white dove fly it there and sometimes she’s slow. Seriously though you should get it by the end of the week for sure. Aw, the white dove express – well that explains it. 😉 I look forward to getting it, sweetie. Excellent trivia post. Being avid trivialist, you even found stuff I didn’t know. Thanks! I like to say “Frohliche Weihnachten!” (I don’t really know what the difference is – or if Frohe is better?!) Great post!! i kinda need information about the song heri za krismas by jay althouse can anyone help please? I found this YouTube video: http://www.youtube.com/watch?v=PYM1p_R0IkU There also seem to be other versions on the same page on the column to the right. Enjoy!